Did you know you can download books for free from Amazon and read them on your iPad, iPhone, Droid, Windows phone, or laptop, not just the Kindle Reader ? Pretty amazing isn’t it! If you’re into the classics , you can download them for free and read them in the Kindle. Not only that, many books available for the Kindle on Amazon show up for free from time to time. I’ve picked up about 2o cookbooks about Paleo, gluten-free, and real food just by keeping an eye out for the free ones. Admittedly not every book is a keeper, and I’m okay with that since the books were free to begin with. To manage your Kindle library, you’ll need to login to Amazon. You can choose where to read the different titles, and if you want to delete one from the library. You can also loan a book to someone else. 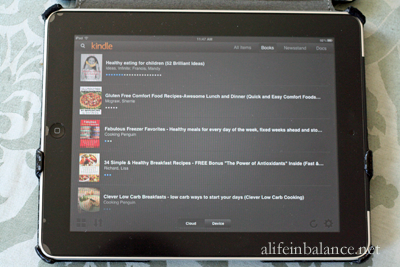 Do you use the Kindle or another e-reader to read books? Link up an old money saving idea post (we want to give love to some of your older posts). No giveaways or deals posts. Recipes are allowed, but share how it is thrifty! A link back is nice, but not required. Visit the other links and share a comment. Disclosure: To help pay for running this blog, I am an Amazon Associate. Thank you Barb for including my DIY Christmas Wreath tutorial in your Frugal Thursday round-up!